The Agents of Atlas is a team that by all rights probably shouldn’t work. But it works really well. They are a team from the 50’s that worked for the government that is brought back together during Dark Reign. The team consists of the team leader and head of the Atlas foundation Jimmy Woo. Former Marvel Boy, The Unranion. Ken Hale the Immortal Gorilla Man. Namora, the cousin of Namor the Sub-Mariner. Venus, a greek legend wanting to atone for her past crimes. And M-11 a former death robot that has been reprogrammed. 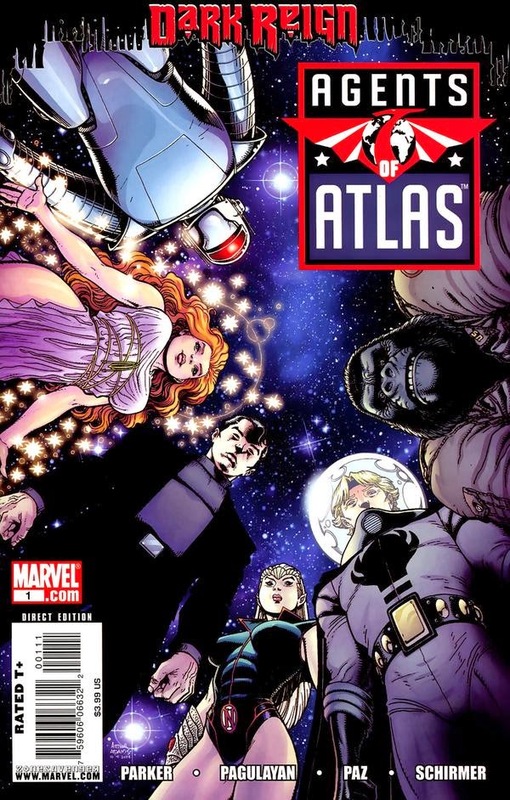 The Agents of Atlas use the reputation of the Atlas Foundation of being villains to try to help sabotage H.A.M.M.E.R. while at the same time keeping Osborn’s trust to keep gaining intel on the organization. But this book had me at Jeff Parker writing a 6 foot gorilla with guns. That said the characters really work well together. And the way the team works makes the reader question which side are they really on. And when their past comes into play the story really takes off. The past is used to explain the teams past with the American Government and Atlas Foundation when it was an evil organization run by the Yellow Claw. Jeff Parker is once again spot on with his characterizations. Gorilla Man and M-11 really feel like an early version of Rocket and Groot from Guardians of the Galaxy. Except they don’t interact with each other as much. Parker also really makes the character of Namora, a character I always thought was uninspired, very compelling. And I would really like to see somebody really run with Venus. She has a lot of potential. it’s not the best thing I have read by Jeff Parker, but it is really fun and definitely worth the read. Thanks for reading. If you have any comments, questions or suggestions of other books to read please leave me a comment in the comments section. Stay tuned because next week I am going to start something a little different for a little while. And as always. Keep reading comics fans.